. . . but it never truly stopped. A tail wind has the opposite effect that you think it would, because the wind is at your back, there is no benefit of the cooling effects it has on the body, so a tail wind seems to always leave a cyclist overheating and sweaty. So today a slight headwind was welcome. ie. . . the wind. As a group we were hating life, and seriously questioning our logic and enthusiasm for even considering this. . . what did they call it??? an epic event. . .
EVERYONE TO PUT THIS ON THEIR BUCKET LIST? They say that this stretch is only 5.3% grade??? 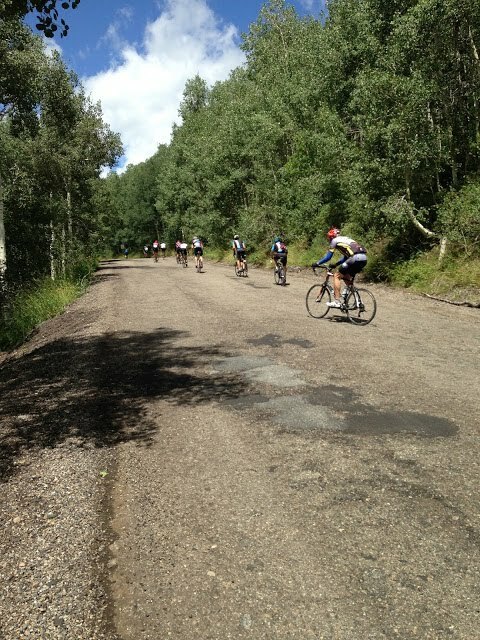 Empire Road boasts a consistent grade of 10%-14% and climbs 2100 ft in a short grinding 6.4 miles. but, nonetheless, it was still blowing.
. . . not one soul was able to give me a convincing answer. After a great debate within myself, I stopped for a short rest and the wind was blowing so hard I could not get going again, not even paperboy style. . .
to get back on your bike and pedaling on a 14% grade. stopping turned out to be a very bad idea. my legs didn't complain much though. I questioned myself. . . was it necessary to stop? Even today, I still wonder. I was able to catch up with Charcie and Becca, and presented my plan to Charcie, as Becca quietly listened, I assume with curiosity, to how Charcie would feel. This section, was taking longer than we anticipated. . . It was now a reality that we were not going to arrive at the finish line before the pros came through. I knew from my training rides that Little Cottonwood takes an hour on fresh strong legs. . . I was guessing on tired, beat up legs it would be at least 90 minutes. Our fear was that in the ride guidelines, ANYONE not finished when the pro’s came through would NOT BE ALLOWED to finish. . . period. There was good logical reasoning for this. . . After the Pro’s come in, the canyon becomes dangerous, at best. dozens of Cyclists, riding down, Cars, people, thousands of them all trying to get back down the canyon. The reason they were up there, and for many of them it was a whole day affair, were now ready to go home. It was a sketchy proposition for a cyclist going up. Setting aside the expense of this accomplishment, it requires 1000’s of miles on the bike, which equates to hundreds of hours of training involved to earn the Triple Crank Award. It quickly becomes a family affair. Everyone sacrifices so we can train and be successful in our endeavor. Rockwell is difficult logistically. Becca and Charcie probably wouldn’t be able to repeat the ride again any time soon. It requires 4 days away from Family, Work, Home. . . difficult for both of them. LOTOJA, we all knew we could do that, we’ve done it several times before. Ultimate Challenge was taxing. Emotionally ~ ~ ~ Physically ~ ~ ~ Mentally. This is the ride that NO ONE wanted to repeat. . . Thus it was imperative that we finish THIS YEAR for our Triple Crank,we had come too far to be unsuccessful and for us, it was a one time attempt. We would ride to the bottom of Big Cottonwood canyon, 14 miles of downhill then once we turned the corner headed to Little Cottonwood Canyon we would load up in the Green Goblin (ie: our truck) . . drive to the top, claim our medals, watch the pros come in, drive back down the canyon where we were picked up and FINISH the ride officially. This way we would be able to say we did it, every linear foot of pavement and feel good about our accomplishments of the day. In addition, by the time we got back down to begin our ride UP to Snowbird, the majority of spectator traffic would be gone, making it safer for us. we were in this together, and Becca reluctantly agreed. It was a fabulous plan and it was a win-win.
. . . or rather upward. I spotted the summit . . . I could see where cyclists were on the last and final switchback. . . Arriving at the summit, I paused and saw that Becca and Charcie were right behind me. We didn’t hesitate down the short descent in preparation for the next short, but not for the weak, climb of. . . The Park City side of Guardsman Pass is an AWFUL road! In fact, it’s questionable to call it a road suitable for road bikes. While, it’s only 1.6 miles long, it is equally steep, which isn’t the bigger problem. The real challenge with this road is what it’s made of. this road surface would be bad enough on a flat even surface let alone a hill that sports 10%-12% grade, that at the very summit as the road bends to the top showed 21% on my gps. . . (‘m not sure where they got the 13.3%) . . . I’m going with what I saw on my computer!
. . . Either way, my friends, it is a brutal 1.6 miles on any given day, but especially when you have 70+ miles and now close to 11,000 ft of climbing on the legs for the day. within a few feet of the top. . . my angel of mercy came to my aid. . .
A spectator offered to give me a push. . .
that I was now a benefactor of such generosity. There was no way I was turning that offer down! and he definitely earned a spot in heaven . . .
but you get the idea. . . right? With gratitude I accepted his offer as his little shove helped me over the crest of this mountain, the longest and most challenging thing I have EVER done.
. . . but at the top it gets cold. . . fast! It was flat out cold. The only time I remember being colder on a ride was when I was in SLC for a training ride. I had come unprepared for inclement weather and when reaching the top of Big Cottonwood Canyon (Brighton Ski Resort), it was cold, and raining. . .
allow me to correct myself. . .
but then it turned to hail. If you have never been in a hail storm as you are riding your bike at approx 30-35 mph. . .
Those little pellets of ice hit and pierce at the body like stinging darts. I slowed my speed slightly to ease the force those stupid little ice pellets were exerting on my body. I was just seconds ahead Charcie and had completely lost track of Becca and hoped she was okay. the Green Goblin, and Superman there waiting for us. . . I had never been so grateful to see him! Becca came in right behind us.
. . . and we quickly bundled up. The three of us were putting on arms, legs, and all the rain gear we had as we began the descent down Big Cottonwood Canyon. the warmth felt good, but as we descended out of the canyon the rain subsided and we began to warm up and knew I would have to shed everything. In fact, had I known that the rain was going to stay at the top of the mountain I would have just toughed it out, but often the decisions we make we get to live with for a while. there were a couple of spots that were flat out sketchy! We made it to the bottom of Little Cottonwood at 2:15 pm. We only had about 45 minutes to spare before we anticipated the pros to come flying through. By now, I was sweltering hot. We shed our gear and the wind felt fantastic as I cooled down. Superman was just up the road and as our plan was, we loaded up we were less than 1 mile up the road and found it closed to all motor vehicle traffic! This section of my report ended up being longer than I anticipated, so I promise we will finish up next week. I have it basically written and pictures for most of the post so it should be a quick one to finish up.